I’m not a father (and will resist sliding into the “as far as I know” trope). Fortunately, though, I still have one. As Father’s Day 2017 approaches, it’s time to dig into the goody bag to see what I can possibly give to my dad to basically just say “thanks” for not disowning me at a very early age (something I’m sure he regularly considered). So some dad-pampering is in order. Pampering, as far as i’m concerned, involves the application of comfort. From head to toe. So let’s start at the toe bit. To quote Spinal Tap, “There’s a fine line between stupid and, uh, clever.” And there’s a fine line between clever and offensive. Not sure how you’ll react to footwear called “ahhSoles,” but the fact that they are touted as “offensively comfortable” means the creators at least get the potential issue. Anyway, there’s nothing offensive about how comfortable they are. Flip-flops with textured inner soles modelled after soft coral, sea grass, and something akin to a sandbar. Solidly constructed, they offer a nice, relaxing foot massage while wearing. In keeping with the comfort theme, one thing most dads (and all of us non-dads) crave now and again is silence – or a least an acceptable variance on silence. Two items have landed on my desk and have found their way into my aural cavities. They both enhance and reduce noise. I’ve talked about the Etymotic mk5 Isolator Earphones here, so please go there for a more complete rundown. Suffice to say, they effectively block external noise and seriously enhance the listening experience. Without batteries or bulk. I’ve had them jammed in so far I’m convinced they’ve fused with my brain. Another aural offers a interesting way to combat noise. You’ve heard about “fighting fire with fire?” How about fighting noise with noise? It’s a bit of a weird concept, but many of us actually relax better with a bit of noise. No, not Mariah Carey, but some good quality “white noise” (Google, if you must). It’s a kind of frequency hiss that has a lulling effect. Sound Oasis has released its model S-001 World’s Smallest White Noise Machine. This tiny device charges (or plays constantly) via USB. Juice it up, connect and insert supplied earphones (or use the aforementioned mk5s to really block external sounds) and dial in your preferred tone (you have 10 to choose from), set the volume and drift. Great not only for assisting with sleep and helping the wearer concentrate, the S-001 will also help dad if he – like me – has developed tinnitus (that annoying ringing in the ears) from years of playing in VU-meter-popping rock bands. Comfortable footwear and nice sounds (or lack of any) will no doubt help dad relax. Of course, combine the two with a good libation and mellowness is practically guaranteed. As they say, alcohol isn’t the answer, but it sure helps you forget what the question was. Wine is fine (pretty much anytime), and for al-fresco chilling, dad could do worse than sip on a glass or three of Lamberti Pinot Grigio Delle Venezie or Inniskillin Riesling Reserve. The former offers a crisp, floral, almond and mineral nose and a dry, fruit-forward palate while the latter (in the 2014 vintage) shows classic Riesling aromas of stone fruit and that distinctly “petrol” note that top-quality Rieslings take on with a bit of age. Dry, balanced, zesty and crisp – a great summer afternoon refresher. If throwing some meat on the BBQ is in the cards for Father’s Day, you’ll probably need a few decent red wines. A pair of South African Cabernets would do any steak justice. “The Winemasters” Cabernet Sauvignon 2013 from Nederburg and the Fleur du Cap “Bergkelder Selection” Cabernet Sauvignon 2015 both offer what South African red wines deliver in spades: loads of ripe aromatics, layers of rich, plush, black fruit-tinged flavours, and unbeatable value. Similar things could be said about the Norton Barrel Select Malbec 2014 when it comes to value in full-flavoured, full-bodied red that gushes smokey, blueberry flavours. If dad’s feeling a bit more patriotic (and with Canada looming), you might want to opt for the black-cherry, vanilla, mocha, cedar and menthol-tinged aromatics and elegant, well-integrated flavours of the Inniskillin “Discovery Series” Merlot Petite Verdot 2015 from Niagara. Should dad decide that perhaps a pre-dinner (and pre-dinner-wine) cocktail is in order, why not hit him with something a bit different. Britain’s Black Cow Pure Milk Vodka/Spirt (take your pick) is a whey-based hootch that sports the crisp, clean, subtle taste of more traditional vodkas, but with a much more round and viscous feel in the mouth. Swap for vodka in a martini or other cocktail. While we’re on to cocktails, the nifty Microplane Ultimate Bar Tool [pictured above] combines several of the most used bar accoutrements into one convenient wand-shaped contraption. 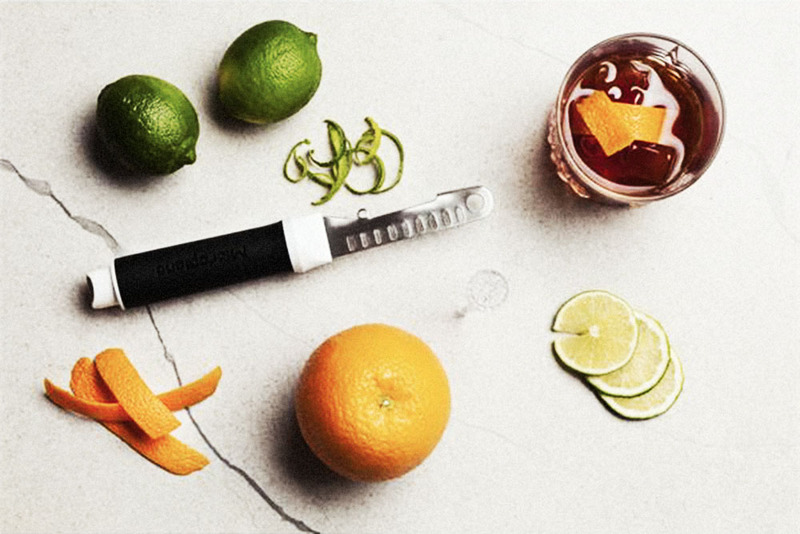 Muddle, stir, cut, score, strain, and create garnishing twists and peels from citrus fruit with just one tool…cool! With the dad’s day (and possibly dad himself) almost done, it’s time for him to indulge in “sunset with scotch.” Let the golden/amber hues of The Macallan Double 12 Year Old Double Cask single malt reflect the last of the sun’s rays while captivating aromas of butterscotch, vanilla, mocha, and dried fruit perfume the summer night. Wonderfully mature (just like the Old Man), its smooth, rich, seductive palate will keep dad (and you because you’ve been so good to him all day) warm as the stars replace the sun. Now, if all those photos you took have clogged your smartphone’s memory to the point where deletion is the only option, no need to fear (or be dragging your computer around to download to). The Picture Keeper Connect (with it’s downloadable software app) allows you to quickly and easily dump all your amassed photo albums onto what is essentially a dual-ended USB key. Plug one end into your phone to download onto the Picture Keeper Connect. Remove it, plug the other end into your computer’s USB drive, and download all those pictures onto your computer hard drive. You can now either delete the photos from the Picture Keeper Connect or keep them loaded to view without having them take up phone memory space. Finally, you might not have time to get your hands on any of these potential gifts prior to Father’s Day (my fault for not getting this to my web editor much sooner). Never fear; all these items will certainly be appreciated at any time of the year, for any reason, by anyone.